Every year, we celebrate that special day whether it is a milestone or just another year older and wiser. 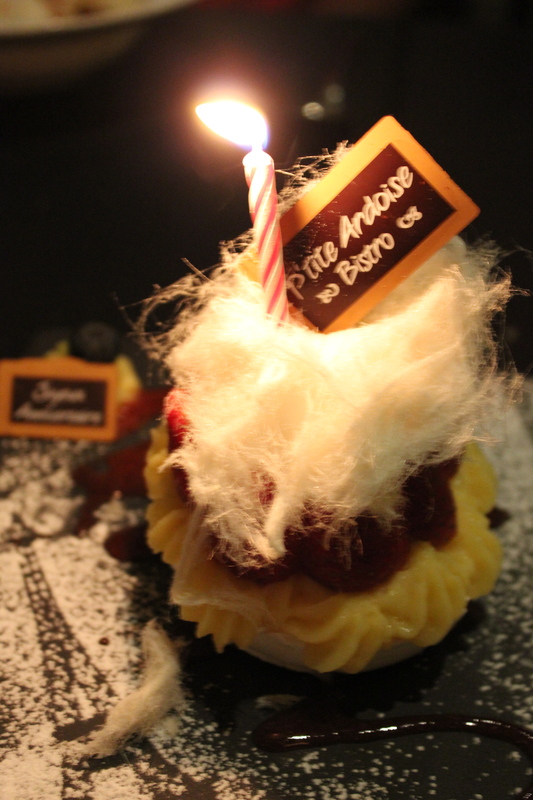 To celebrate my birthday, my family and I went to P’tite Ardoise Bistro for my birthday dinner. I was lucky to call up a day before to make a booking as I found out from the manager on that day that the restaurant was fully booked! Yep, and it’s a Thursday night too! One step inside P’tite Ardoise and I am instantly transported into a French Bistro in Paris. The atmosphere and ambience was cosy and romantic with soft French music playing in the background. We started off with some Red wines while taking our time to peruse our menu. Luckily, it turns out that I knew the manager there as we did BodyAttack in the gym together! How awesome is that! It definitely made our decision-making process of what-to-order so much more easier and all he did was recommend the food to us and we gave our thumbs up to his recommendation. We were also offered a choice of bread to choose from mini baguettes, seeded to herbed dinner rolls with accompaniments to the bread from olive oil, butter spread and a salty olive tapenade. To start off, mum had the Terrine du Chef ($21), dad had the Seared Scallops ($21) and I had the Escargot a ma facon ($19). 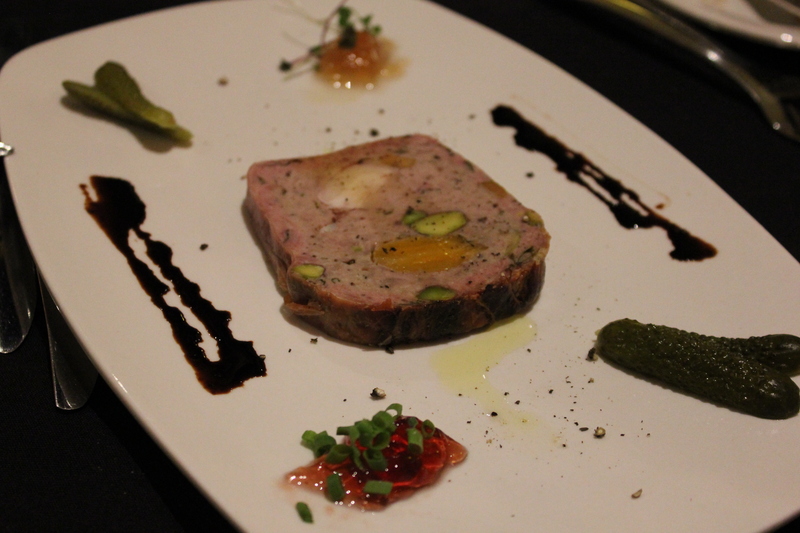 I tried mum’s Terrine and it was fresh, seasoned well and bursting with flavour. Whenever I am in a French Restaurant, snails is a must order for me. The snails at P’tite Ardoise is different and definitely not your usual garlic butter snails. Under the toasted circle of crisp buttery bread of each ramekin, lies around four to five snails swimming in the thick and creamy sauce. It was so delicious and the flavours worked very well with each other. 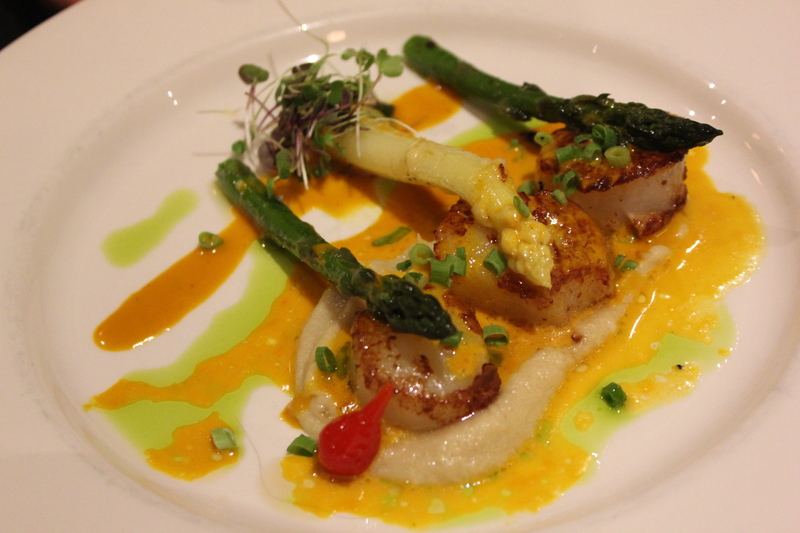 The scallops also came with white and green asparagus, celeriac puree and carrot cream sauce. I had a taste of dad’s scallops and it was fresh and cooked to perfection which also complements the celeriac puree and carrot cream sauce well. It was executed with attention to detail. For our mains, mum had the Casserole of the Day ($42) which is a Bouillabaisse, dad had the Fillet Mignon ($43) and I had the Sauteed Beef Fillet Flambee ($39). 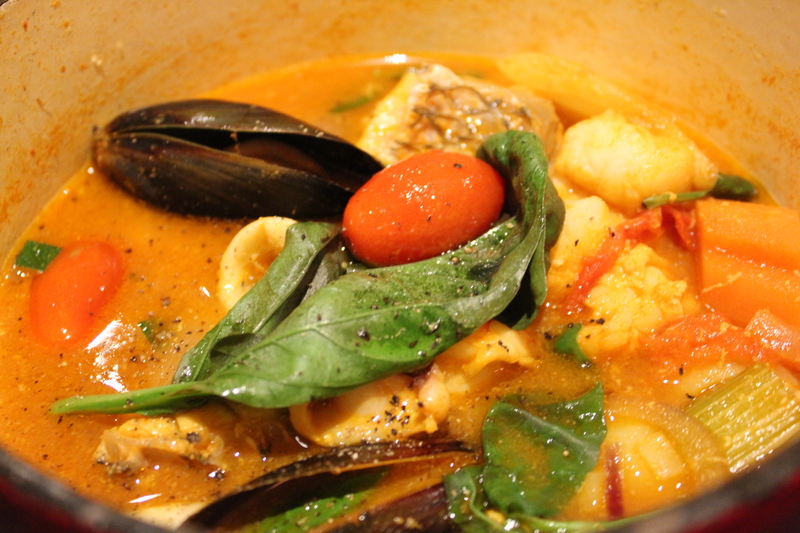 I had a taste of mum’s Bouillabaisse and it was full of flavour. There were also a generous amount and variety of seafood and the tomato based broth was rich and flavoursome from the fresh seafood. 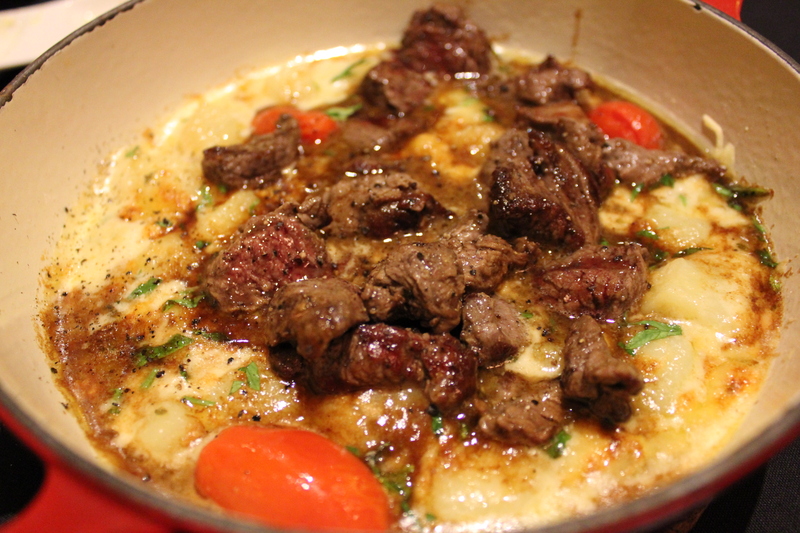 The Sauteed Beef Fillet Flambee Cognac also comes with Potato Tartiflette, Cherry Tomato and Jus. My dish arrived in a hot cast iron Le Creuset pot, the same as mum’s Bouillabaisse. The little beef fillet pieces were so succulent and juicy. If you love your cheese you will love this dish too. The melted blue cheese on the potato tartiflette was delicious and the cherry tomato is an explosion in your mouth. This was definitely one hearty and satisfying dish – I loved it. 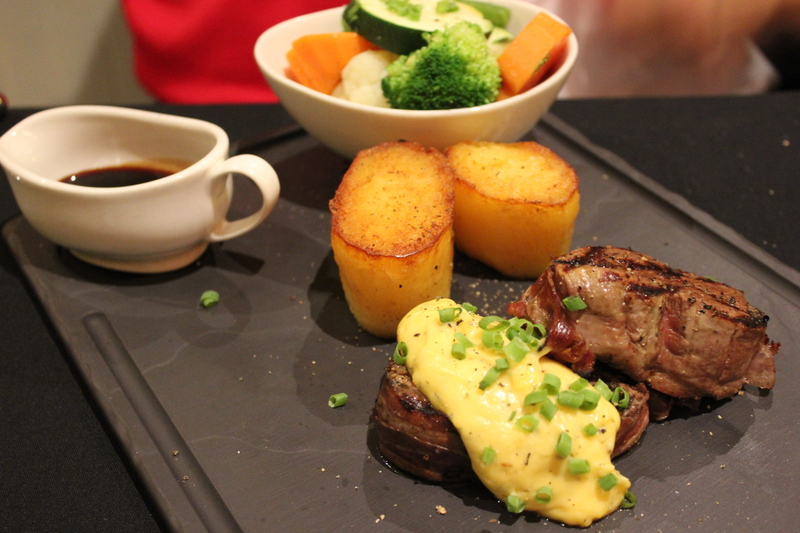 Dad’s Fillet Mignon consisted of a WA Beef Tenderloin wrapped in Streaky Bacon, Fondant Potato, Shiraz Jus and Bearnaise. Dad enjoyed his Fillet Mignon and thought that it was cooked perfectly to medium, tender and seasoned well. The beef tenderloin also complements well with the jus and the thick and creamy bearnaise – one of the best bearnaise around Perth! YUM! Always leave space for desserts at a French restaurant as we all know French desserts and pastries are to die for. I decided to go for the Lemon Vacherin ($15) which consists of meringue, lemon sorbet and curd, strawberry and rhubarb. Because mum told the manager that it was my birthday, he surprised me with a candle on top of the Lemon Vacherin dessert accompanied by a Happy Birthday song from him and another waitress. I must say that the Lemon Vacherin looks and tastes amazing. The sweet and sour flavours marries each other well. It was such a lovely dessert – not too sweet or sour, it was just perfect. 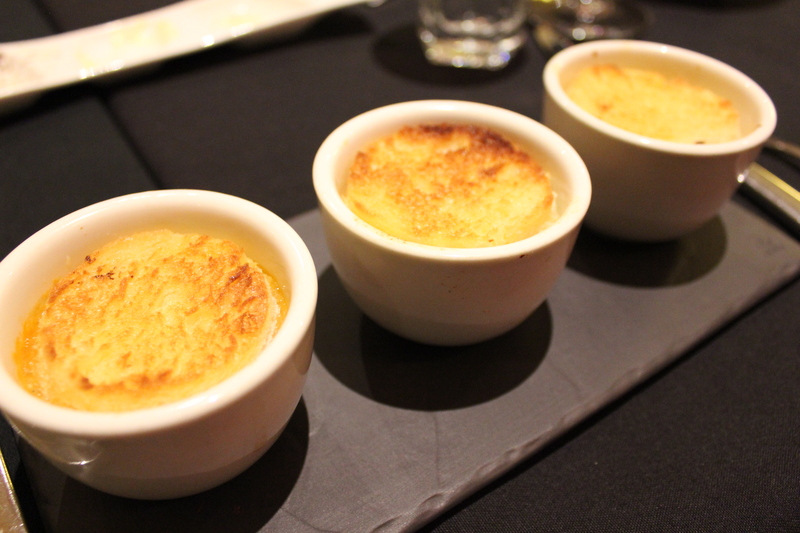 Dad and mum shared the Ile Flottante ($12) Ile Flottante is also known as Floating Island and usually consists of meringue floating on the Anglaise sauce. I had a taste of the Ile Flottante and it was light, soft and smooth in texture, complementing well with the thick and creamy Anglaise sauce. I really had a great night at P’tite Ardoise and everything was executed well from the start to finish and also, food and service. Now I know why P’tite Ardoise Bistro is so popular and has such a good rating among Urbanspoon too. 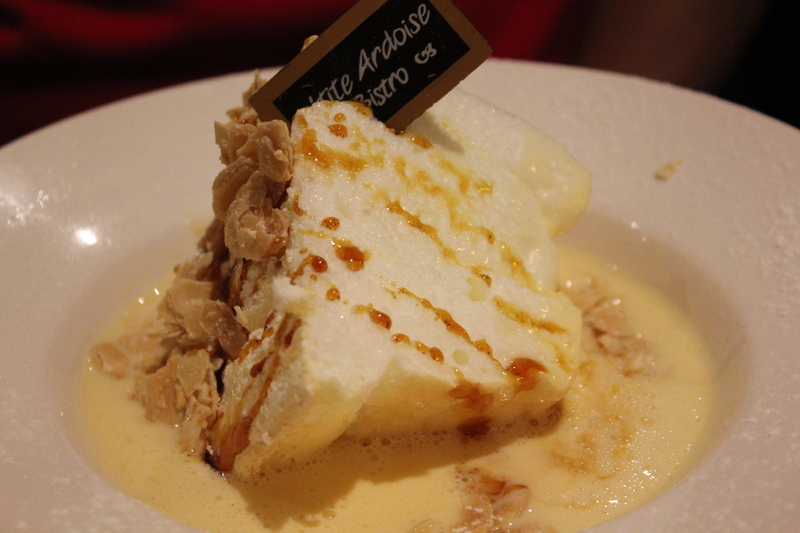 After our first visit to P’tite Ardoise, I decided that I have to make a second visit again one day! 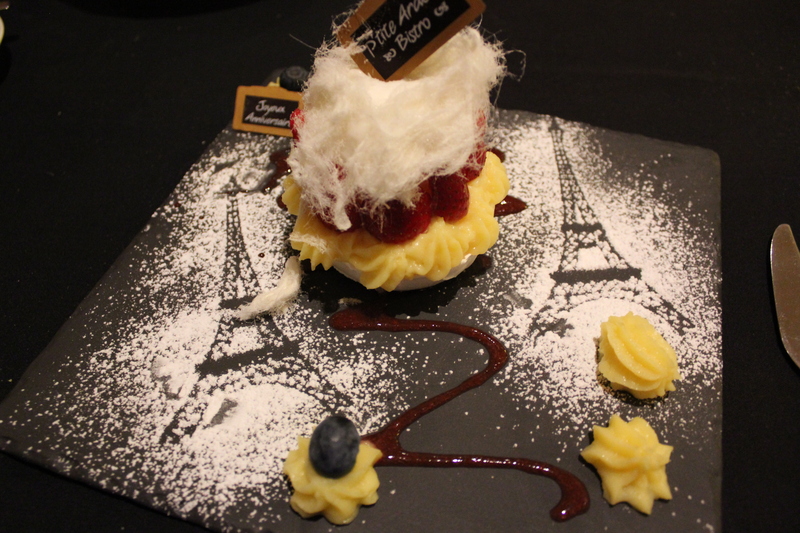 I highly recommended P’tite Ardoise for authentic French food with a nice, charming atmosphere perfect for dates, that special occasion, birthdays or maybe a nice catch up with friends over fine food. It looks delicious, and happy birthday to you!